NASA, Lockheed Martin, and the U.S. Air Force have resumed preparations for the Orion Ascent Abort-2 (AA-2) test after the five-week long government shutdown disrupted work. The AA-2 test will collect data on the performance of Orion’s Launch Abort System (LAS) by initiating an abort at a high-stress point during ascent. Major pieces of flight test hardware were about to be shipped or were being delivered to NASA’s Kennedy Space Center (KSC) in Florida and the adjoining Cape Canaveral Air Force Station (CCAFS) launch site when the shutdown closed several federal agencies including NASA. Although some work was able to be restarted before the shutdown ended, it is expected that the launch date for the test will be delayed a couple of weeks into mid-May. The Orion LAS is designed to immediately pull the crew module away from its launch vehicle in extreme emergency situations that might occur before or during launch. 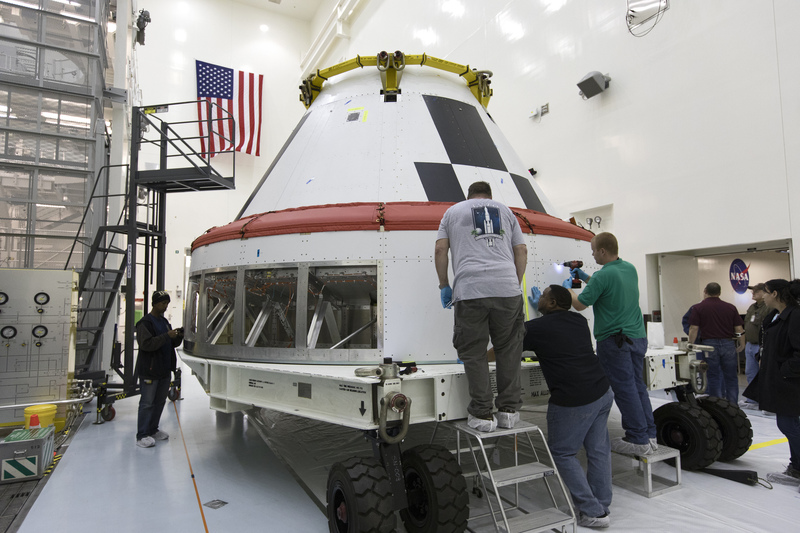 For the AA-2 test, a highly instrumented crew module simulator will be connected to a flight version of the Orion LAS and a modified Peacekeeper missile being used as the test booster. The test will start from Space Launch Complex 46 at CCAFS; NASA is using some of the buildings in its Exploration Ground Systems (EGS) infrastructure at KSC for final processing of the hardware before it moves to the pad for final assembly. Prior to the shutdown, NASA was expecting to be ready to launch the test at the end of April. 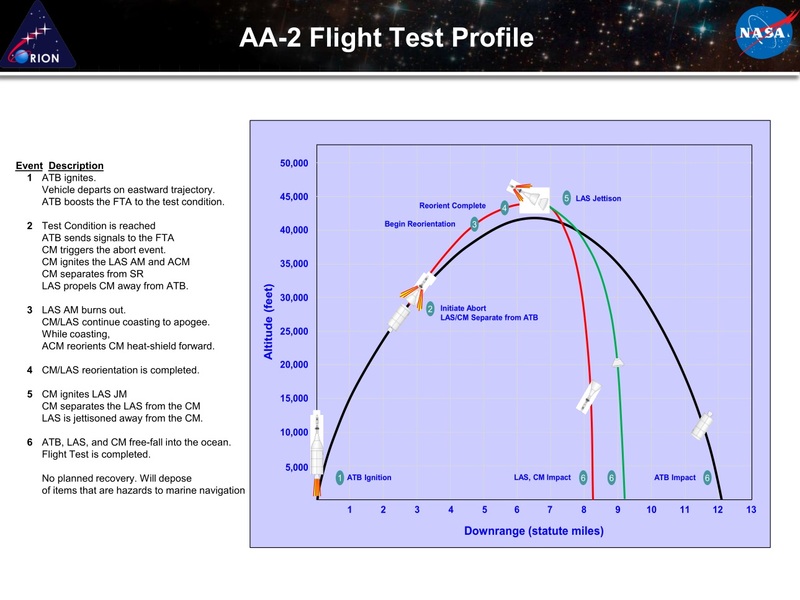 NASA presentation slide showing the flight test profile for AA-2 test. Credit: NASA. At KSC the launch abort system (LAS) hardware is being assembled in the Launch Abort System Facility (LASF), the test Crew Module and Separation Ring (CSR) assembly is in the Multi-Payload Processing Facility (MPPF), and the solid-rocket abort test booster (ATB) is in the Rotation Processing and Surge Facility (RPSF). Additional hardware is being tested in the MPPF and temporarily stored in the Vehicle Assembly Building (VAB). While technicians have resumed assembly and testing of the flight-test vehicle elements, program management will monitor progress for a little while longer before re-assessing the schedule and picking a new launch date. “I asked the team to go look at — hard — where you’re at, how long it will take you to recover, and then we’ll reconvene and we will announce a new launch date,” Kirasich said. The partial U.S. government shutdown started when Fiscal Year 2019 (FY 2019) funding for several federal agencies including NASA expired at the end of the day on December 21. Funding was not re-established until five weeks later when another continuing resolution that extends for only three weeks was enacted late on January 25. Recent views of a few of the major hardware pieces for the AA-2 at the Kennedy Space Center. 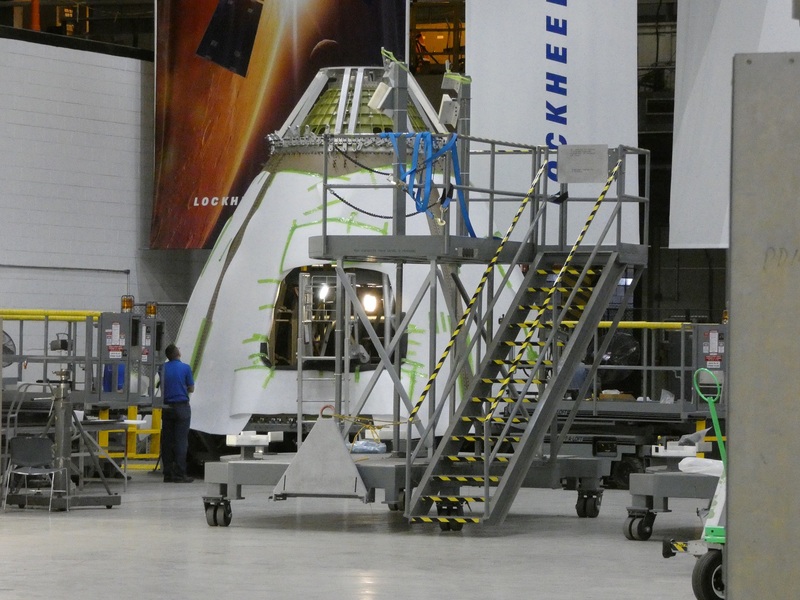 The Crew Module and Separation Ring are in the Multi-Purpose Processing Facility (MPPF) on the left; on the right in the background, the aeroshells that will fit over the booster for the flight test in High Bay 4 of the Vehicle Assembly Building. Credit: NASA. The shutdown forced essentially the entire NASA civil servant workforce to be furloughed and most facilities closed, with some exceptions being made for ongoing mission operations and high-priority mission preparations where personnel had to keep working without pay. At its onset Kirasich said the shutdown complicated the logistics of handling hardware just arriving or in transit to Florida for launch. The Air Force was not directly affected by the government shutdown, as Department of Defense full-year funding was enacted before FY 2019 began on October 1; however, non-exempt NASA facilities were closed and work on the AA-2 test stalled. The lapse in funding over the holidays and most of January broke the record for the longest shutdown ever and Kirasich described some of the process to restart work as the shutdown got longer and longer. Two of the LAS motors in the LASF in September, 2018. The abort motor made by Northrop Grumman Innovation Systems (NGIS) is on the left, the jettison motor made by Aerojet Rocketdyne is on the right. The third motor, the attitude control motor (made by NGIS), was delivered during the period disrupted by the government shutdown. Credit: NASA/Frank Michaux. “In the Launch Abort System case we were able to build an exception rationale and we were able to get Lockheed back in that building (the LASF). It wasn’t on day one of the shutdown, it was a couple of weeks I think into the shutdown we were able to get Lockheed Martin back in,” he continued. Although the Air Force was not directly affected, they couldn’t work in NASA facilities that had to kept closed. 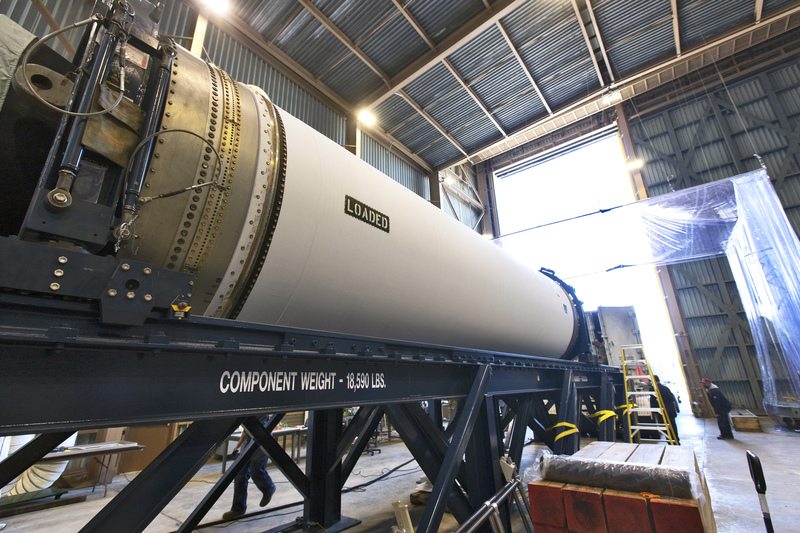 “It was really unclear at the onset of the shutdown that we would even be able to accept their hardware on KSC property, so our initial decision was we ship the solid rocket motor and we stored it on the Cape Canaveral Air Force side, we didn’t ship it to Kennedy because the DoD was not shut down,” Kirasich explained. The Abort Test Booster’s SR-118 motor following arrival at the RPSF on January 29. Work to get the motor transported to the facility was suspended during the shutdown. Credit: NASA/Cory Huston. “So we shipped the motor, we put it in a temporary facility on the Cape Canaveral side. The guidance control assembly, which is their avionics half of the rocket, we held. We held at Chandler, Arizona, when we started,” he added, referring to Northrop Grumman’s facility. A Northrop Grumman SR-118 solid rocket motor is the booster for the test. Its original purpose was as the first stage of the Peacekeeper Inter-Continental Ballistic Missile (ICBM). The Peacekeeper program was deactivated in 2002 and today the motors in the inventory are used for commercial purposes such as space launches. “Then the shutdown kept going so I said ‘boy, let me see what I can do with these Air Force pieces.’ And it was very interesting, I had to work with lawyers here at Kennedy and Johnson [Space Center],” he explained. 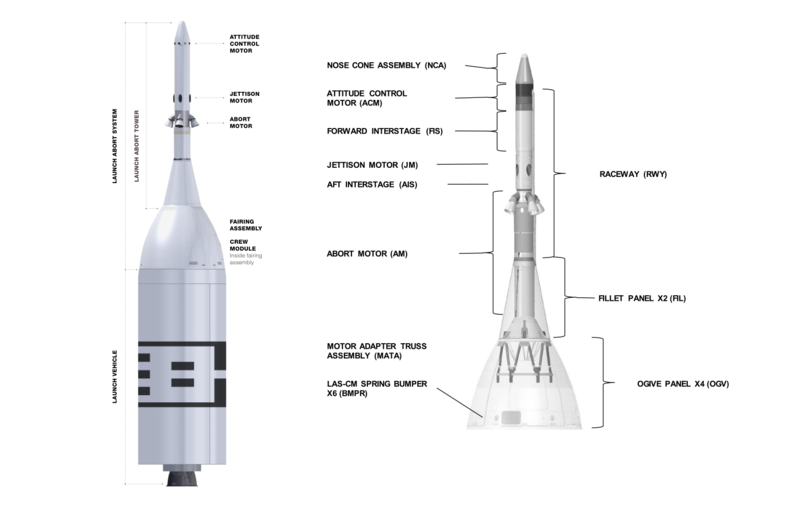 The AA-2 test had been scheduled for December, 2019, between the second and third Exploration spaceflight tests, Exploration Mission-1 (EM-1) and Exploration Mission-2 (EM-2). The latter will fly crew for the first time on Orion and the Space Launch System (SLS) and the AA-2 test is one of the prerequisites for crew-rating the Orion system for EM-2. In the aftermath of an agency study of flying crew on EM-1, the AA-2 test date was advanced even though it was decided to keep EM-1 uncrewed. “Initially that AA-2 test was supposed to be in December of 2019 and a year and a half ago we accelerated it eight months,” Kirasich noted. Workers remove cover plates from around the Separation Ring of the combined Crew Module Separation Ring (CSR) assembly on December 6, shortly after the CSR arrived at KSC from the Johnson Space Center. Credit: NASA/Kim Shiflett . With everyone back at work for the three weeks that NASA is currently funded, the Crew Module and Separation Ring (CSR) test article is currently wrapping up checkouts in the MPPF. “We have five big elements right now being assembled in four different buildings,” Kirasich said. The elements of the flight test vehicle for the AA-2 test on the left. On the right, the elements of the Launch Abort System, which are currently being stacked in the LASF. Credit: NASA. “The LAS tower assembly will be fully integrated by Feb 9, that includes the MATA, Abort Motor, Aft Inter-stage, Jettison Motor, Forward Inter-stage, Attitude Control Motor, and the Nose Cone Assembly,” Don Reed, NASA Manager of the Orion Flight Test Office, said in an email. The Motor Adapter Truss Assembly (MATA) at the bottom of the LAS tower structurally attaches to the Crew Module. AA-2 LAS structural elements at the Michoud Assembly Facility in August, 2018, partially assembled during testing. The green, primer-painted part at the top is an element of the Motor Adapter Truss Assembly (MATA). That sits on top of the white, multi-panel ogive fairing. Credit: Philip Sloss for NSF/L2. 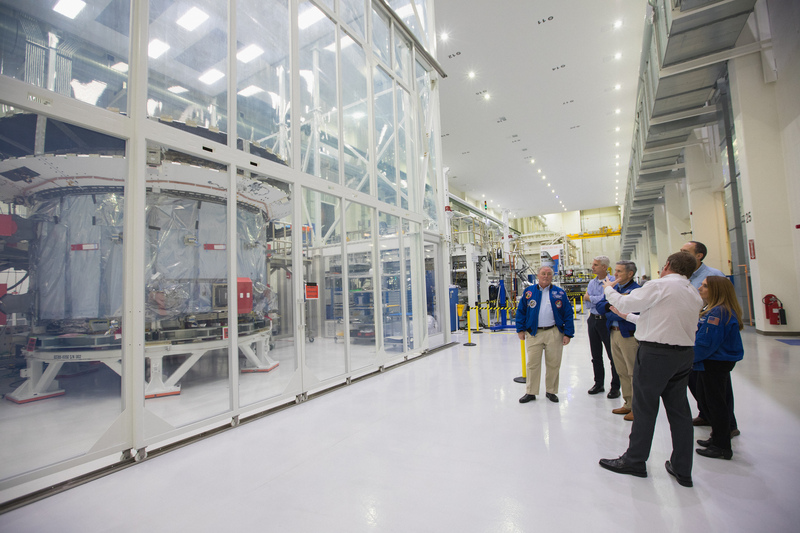 Reed noted that the CSR is planned to move to the LASF on February 14 to begin testing and integration with the LAS. Work will begin with similar soft-mate testing between the CSR and the LAS before stacking the abort system on top. Reed said that testing would begin February 19. After the MATA is attached to the Crew Module, the panels of the ogive-shaped fairing that cover the Crew Module will be installed. “The Ogives will be installed once the LAS is mated to the Crew Module in early March,” Reed noted. “And then we have an integrated Orion test article which will be eventually rolled out to the launch pad,” Kirasich said. A sequence of images showing how the aeroshells fit over the test booster. These images were taken last Summer during practice with an inert motor. Credit: NASA. Reed said the motor is expected to be moved to Space Launch Complex 46 sometime in the last week of March. After the TRS/GCA is mated to the booster, the aeroshell structure will be moved to the pad and lowered over the booster. Currently being stored in High Bay 4 of the VAB, the aeroshell has the same diameter as the separation ring and base of the crew module, and will help streamline the airflow over the vehicle during ascent prior to the abort. Once the aeroshell is mated to the booster, it will be ready to receive the integrated Orion test article for final mating at the pad. Elsewhere at KSC, the Orion spacecraft for the two lunar Exploration missions continue with their assembly, integration, and test work. The EM-2 spacecraft is still in structural assembly, but that work was also exempted so it could continue during the shutdown. The EM-1 Service Module (left) is seen in a clean room at the O&C Building on December 10 during a tour there by the Space Shuttle STS-88 flight crew. Current KSC Director Robert Cabana commanded the mission, which was the first International Space Station assembly mission (second element launch), and celebrated its twentieth anniversary in December, 2018. Credit: NASA/Kim Shiflett. EM-1 spacecraft is now assembled into two modules, the Crew Module and the Service Module. Integration of the Service Module began with the arrival of the European Space Agency (ESA) Service Module (ESM) at KSC in early November. The ESM was mated to the Crew Module Adapter (CMA) to form the Service Module and since then tubing and wiring have been connected between the elements, along with further component installs. Proof testing of the welds connecting the ESM and CMA was recently completed. “We pressurized them to proof pressure and then maximum design pressure, two extremely high pressures, and it’s really the first time the integrated system — all the welds, all the components, the tanks, everything — is at the maximum design pressure,” Kirasich noted. The Service Module is currently back in the lift station in the O&C, where Kirasich said the newly welded tubes are being wrapped with insulation and heaters to protect them from the temperature extremes they will be exposed to during their missions to the Moon and back. “And then this task is going to finish up in about a week and then we roll it into the electrical test station and that’s when we power up, we call it initial power up of the Service Module,” he said.